A new kitchen electronic hopes to do for flatbreads what Keurig did for coffee. camera (Courtesy Flatev) Flatev dough pods seek to do for flatbread tortillas what Keurig and Nespresso did for coffee. Taco fanatics, prepare to start salivating: A new kitchen machine is aiming to revolutionize making fresh tortillas at home with a process as simple as brewing instant coffee. It's flatbread from a pod. 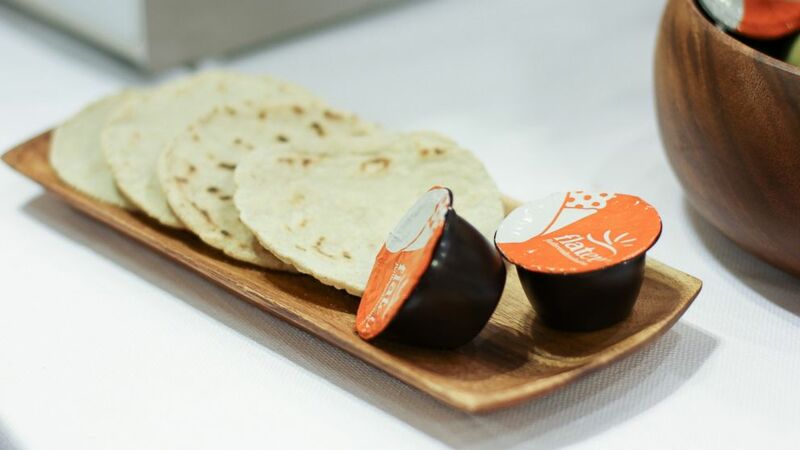 Created by Mexico-born, Zurich-based founder Carlos Ruiz, Flatev is the world's first flatbread product to make use of the same pod packaging technology used by Keurig and Nespresso. The latter company is what initially inspired Ruiz to translate the idea to dough. After suffering the bland flavor of prepackaged, refrigerated tortillas from the supermarket for too many years, Ruiz wanted to create a way for home cooks to prepare fresh, warm tortillas in a more convenient way. Now he has. Prototypes of his Flatev--the name is a hybrid of "flatbread" and "evolution"--machine were recently demonstrated at various food and beverage events in New York City to show how a ball of dough from the pod gets inserted into the machine and is miraculously transformed into a flattened, rough-edged tortilla in under a minute. Afterward, consumers can fill with chicken, beans or rice at their discretion. Future Flatevs pods will likely expand to other ethnic flatbreads, such as naan or roti. While Keurif and Nespresso machines eventually made their way into mainstream retail markets like Macy's and Target, for now the $199 Flatev can only be preordered on a waiting list for 2015 distribution.